Avant-garde, prog and extreme metal come together in the music of self-willed German outfit Todtgelichter. You can expect that we were eager to master and fathom the musical labyrinth on ‘Rooms’. And we succeeded (see our CD review). And there is more. Since there were quite a lot of changes in the band last years and ‘Rooms’ appears to be a kind of resurrection, we took pen and paper and sent them some questions. Drummer Tentakel P, together with his wife Marta the beating heart of the band, answered them in an eloquent and engrossing manner. Changes are evident in life through the years, but quite a lot of changes happened in Todtgelichter since the release of ‘Apnoe’. First of all you took a longer break. What happened? We took a longer break regarding our live presence, that was all. Behind the curtain we were as busy as ever. Marta and I are married, and our daughter was born in 2012 right during the recordings of “Apnoe”. In fact, when our daughter was only 10 days old she already came with us to the studio, I had to watch for her while Marta was doing her vocal parts. It was a funny time, even Kai Hansen of GAMMA RAY (who owned the studio Hammer Studio together with Eike Freese before it burned down in 2013) came in and tried to make her laugh with funny faces. But those things were plannable as we wouldn’t have to do things as a whole band, even with rehearsals we managed somehow – yet when it comes to live appearances you can imagine that with a married couple in the band that has a small baby it was just too early to even leave her for one night over at grandparent’s. We only started playing live again very slowly in late 2014 and very scarce. We took that time to write the next album and get some internal problems off the table. Can you shine a light on the several line-up changes and resume what happened? Please not in full length yet again, haha… this has been the hot topic since 2013 the very least. But I will say this: Around the time we wrote “Angst” small things started to grow, a subliminal discontentedness, which wasn’t a problem at that time but became one. I don’t know if this could have been prevented - I doubt it. One major topic was that Claudio got more and more unsatisfied with Metal in general, and since he has been an important part since ‘Schemen’ it hit us hard when he finally decided to end his active and creative participation (I say active, because he sticks around as a passive member). What’s more, we lost our ways and identity a little and had to struggle to get it back. Some might say ‘Apnoe’ shows that and these days I would only half-heartedly disagree, I still think it is a great album and we are 100% behind it, but right after that we had to do a reinvention of ourselves and get rid of that unhappiness within the band. Sadly that meant that we couldn’t continue with Tobias (and Chris, who felt all this was a bit too much) who was a very good singer for the path we chose back then, but the problem was we realized too late the path was the wrong one for the band to be able to continue. So we faced the situation having to ask him to go separate ways again in order to save the band and go on the path we are on now. To make that very clear: It was not his fault or the great work he did on “Apnoe”, but the tip of the iceberg of a bunch of decisions that ultimately felt wrong. Sometimes things just don’t work the way they should or could have. In the end it turned out okay for both sides, he is active in two new bands these days (one being CHAPTER6IX) – and we still exist (with great new members that allowed us to explore new aspects). Which sounds a bit dramatic, but that’s the way it is. When did you actually start writing the new album ‘Rooms’ and how do you look back at this process of creation? With the line-up problems out of the way everything clicked into place. We had the Album concept, we had new members, we had the ideas and knew what felt right and where we wanted to go again. So we went about it as we always did and just wrote songs – together, in the rehearsal room. The problem is always to get it started. When we have like two or three songs ready, everything else comes naturally. It took about half a year or so, one song each month. Every member contributed puzzle pieces to the whole picture. The most important and hardest thing is to get into this writing mode really, like an exothermic reaction. Looking back I can say it just felt right again. Everything about it. And this feeling is what gives a record soul in my opinion. 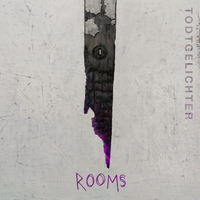 Why is the album called ‘Rooms’ and can you tell a bit more about the lyrical contents this time? The ‘Rooms’ are a metaphor for memories, the longing for a past that is no more, and at the same time acceptance of the fact that times change and nothing can bring those memories back to life again. Like the ‘Necromant’ who revives the dead in his mind, lost loved ones one still thinks of. Those ghosts of the past where living in rooms – rooms that changed, sometimes over centuries, switching faces and appearances with each person that lived in it. I for one have fond childhood memories of the house my grandmother but now that she’s gone, I can’t go back to the rooms that defined her – other residents made that house their own and her essence is gone. These rooms I can only enter in my head. Places of the past. That’s what the title is about in a wide sense. Nostalgia and evanescence. Can ‘Rooms’ be considered as a kind of catharsis of a period with intense ups & downs? Frieder was incredible, he really has church organ experience which I think shows. This is not your cheesy synth organ, that’s the real deal and exponentially harder to play but Frieder pulled it off magnificently. And to the church in general - Oh yes, sacral is exactly the word I have used several times before because that’s exactly what it felt like. I am not a religious person. But I know of people who are, they told me they use churches as a place of meditation rather than following a doctrine, I can respect that. My own memories are my church in that respect. I keep them dear, they define me; and I still have memories dating back to when I was a little boy of maybe two years. Around that age those memories feel like faded photos, but the younger they are in years, the more clear those pictures are, and certain situations even manifest as a kind of video in my head. I treasure every one - and exercise them too lest I lose them. That’s what the album is to me, and the Church recordings (with only 4 room mics in the whole big church, the acoustics were incredible) reflect that and add to the atmosphere. And even when I said I am not a religious person – I can feel something bigger than humanity in those monumental places, and I like the dark and strangely alien atmosphere in churches. They are, to me, not positive places, even hostile – which in turn makes them positive to me, paradox as that may sound. But only when I am alone - the presence of Humans destroys that outworldish mood. Another important change is Marta doing all vocals, clean and harsh, from now on. How did you come to this decision after having her for quite a long time in the band as keyboardist? Keyboardist is maybe too much, she was present on each album, that is correct. On the demo she did an intro and outro, on ‘Was Bleibt…’ there was a piano interlude and on ‘Schemen’ she sang the last song. 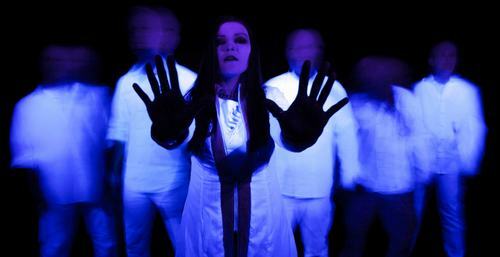 The decision to include her more on ‘Angst’ was because we wanted clean vocals, and she was the best clean singer around. Then on ‘Apnoe’ we wanted the interchanging male/female vocals and also harsh ones, but only after ‘Apnoe’ she expressed new confidence in doing the harsh ones also. She was always into extreme metal (she introduced me to EMPEROR in the nineties for that matter), but somehow we never saw her doing screams and I think before “Rooms” she was not ready to try them either. Not technically, she’s one of the best vocalists I know and I am not saying this because she is my wife – but I think only now she has the confidence to do it. And it shows. Her screams earn her a lot of admiration, even from male extreme vocalists of bands we have played with who have seen her on stage. As for vocals: Nope, not this time. We decided against it to show people finally some consistence in our singer choice. Musically we have a guest solo on “Origin” by our dear friend Oliver, and Claudio – our ex-guitar player who still is somewhat a passive member – is responsible for the arrangement of ‘Pacific’, as well as the guitar recordings on it. In your career you have often used well-fitted quotes of authors in your songs. Can you tell anything about that segment of your sound? We all read much and of course this too influences us. In my opinion it adds a certain cosmopolitan layer to our music. It shows that over centuries people have felt or expressed themselves in a very similar way than we do. The quotes – by the way, the movie quotes as well – underline certain statements we want to make with the music and atmosphere. I am pretty sure we will continue to do so, as it also links us to a universal pool of artistic views and feelings not necessarily restricted to TODTGELICHTER, even if of course every song would work without those elements. Todtgelichter is often linked to avant-garde black metal and I think it suits you well, thinking about bands like Borknagar, Nocte Obducta and A Forest Of Stars. What music do you like to listen to these days, speaking for yourself? And then some TESSERACT, MASSIVE ATTACK, BORKNAGAR, A FOREST OF STARS (there, bulls eye for you). The new TODTGELICHTER (enjoying it anew with some distance from the recordings and release stress). And very much hyped for the new albums of FALLUJAH and IHSAHN at this point. The first tracks (of both) have left me speechless and longing for more. We also have to mention your shift from Aural to Supreme Chaos Records. Why this change and how did you come in contact with Supreme Chaos? That’s a short one. Our contract ran out and we took the opportunity to search anew, SCR with many bands that are friends of ours on board was the most fitting bet. What’s more it’s a German label which makes communication much easier. Will Todtgelichter start playing live in the near future? Thanks for reading, enjoy the album!